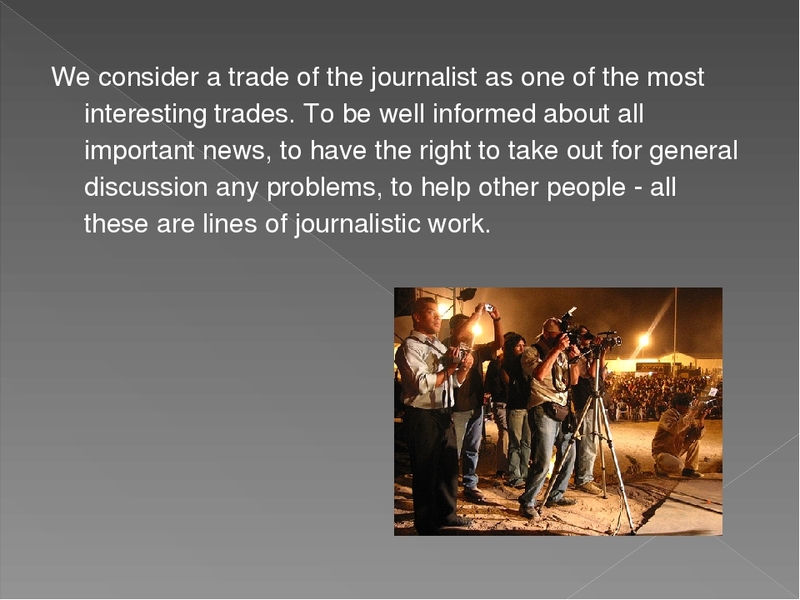 We consider a trade of the journalist as one of the most interesting trades. To be well informed about all important news, to have the right to take out for general discussion any problems, to help other people - all these are lines of journalistic work. 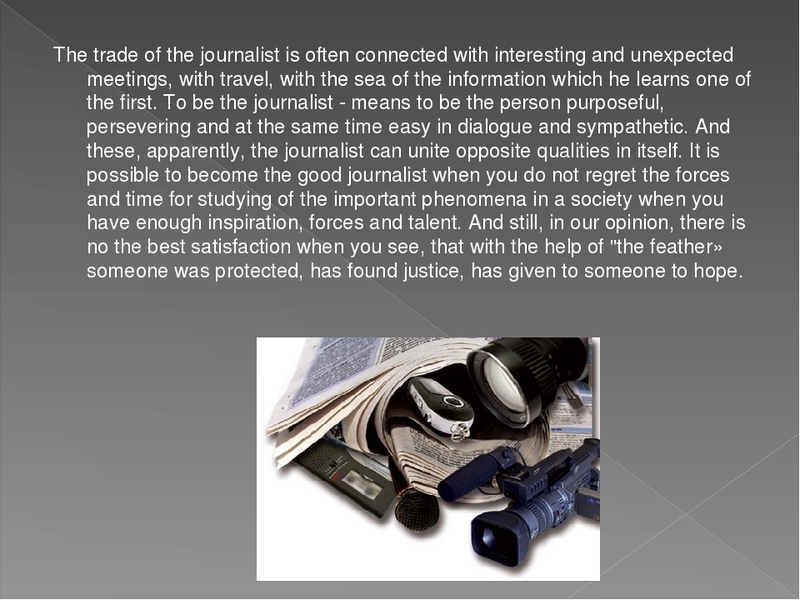 The trade of the journalist is often connected with interesting and unexpected meetings, with travel, with the sea of the information which he learns one of the first. To be the journalist - means to be the person purposeful, persevering and at the same time easy in dialogue and sympathetic. And these, apparently, the journalist can unite opposite qualities in itself. It is possible to become the good journalist when you do not regret the forces and time for studying of the important phenomena in a society when you have enough inspiration, forces and talent. And still, in our opinion, there is no the best satisfaction when you see, that with the help of "the feather» someone was protected, has found justice, has given to someone to hope. 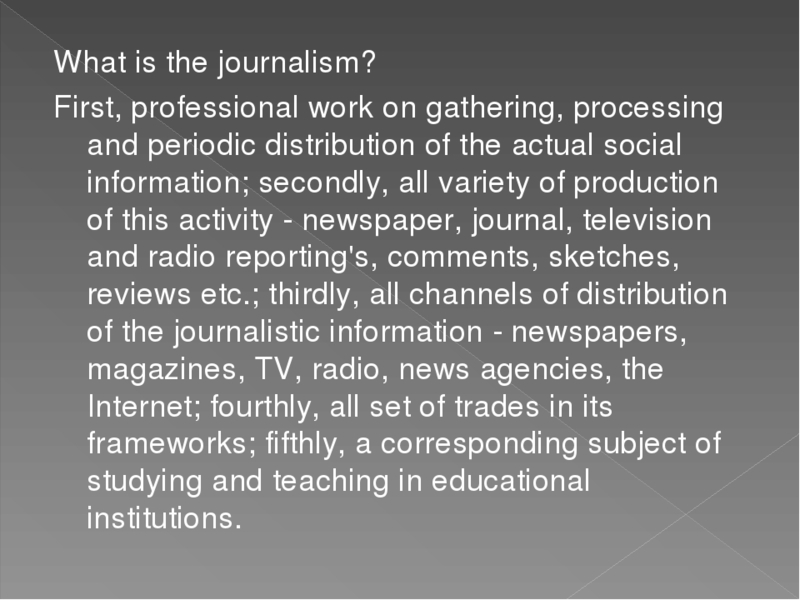 What is the journalism? First, professional work on gathering, processing and periodic distribution of the actual social information; secondly, all variety of production of this activity - newspaper, journal, television and radio reporting's, comments, sketches, reviews etc. ; thirdly, all channels of distribution of the journalistic information - newspapers, magazines, TV, radio, news agencies, the Internet; fourthly, all set of trades in its frameworks; fifthly, a corresponding subject of studying and teaching in educational institutions. 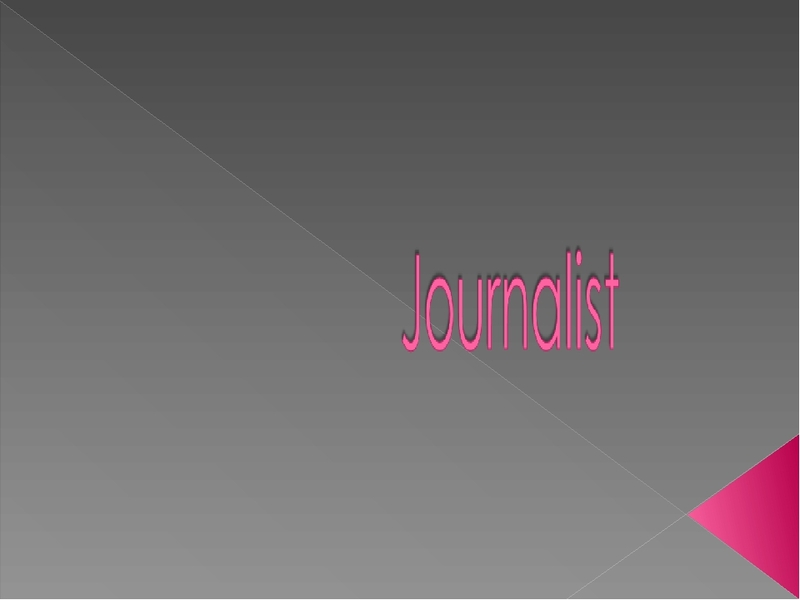 The term "journalism" has occurred from the French word «journal», that means "diary", "magazine". 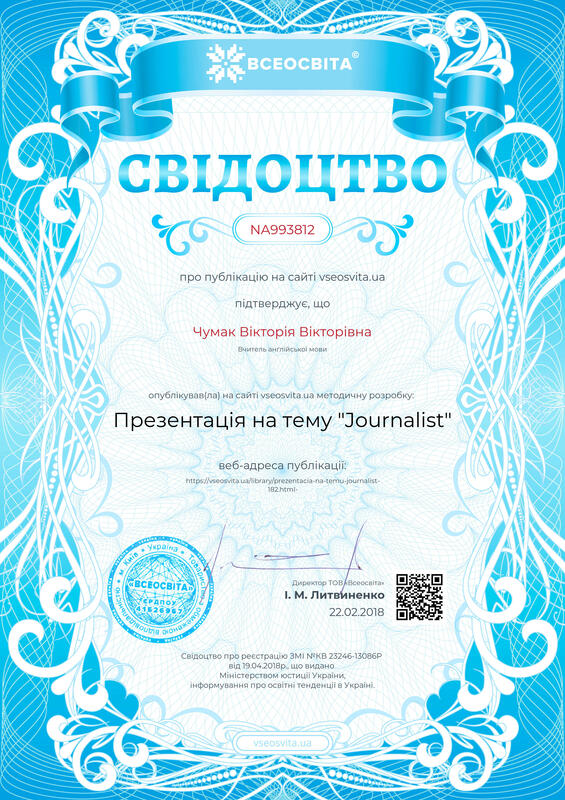 In English language to Russian word "journalism" corresponds «journalism», and in German - «Journalistik». 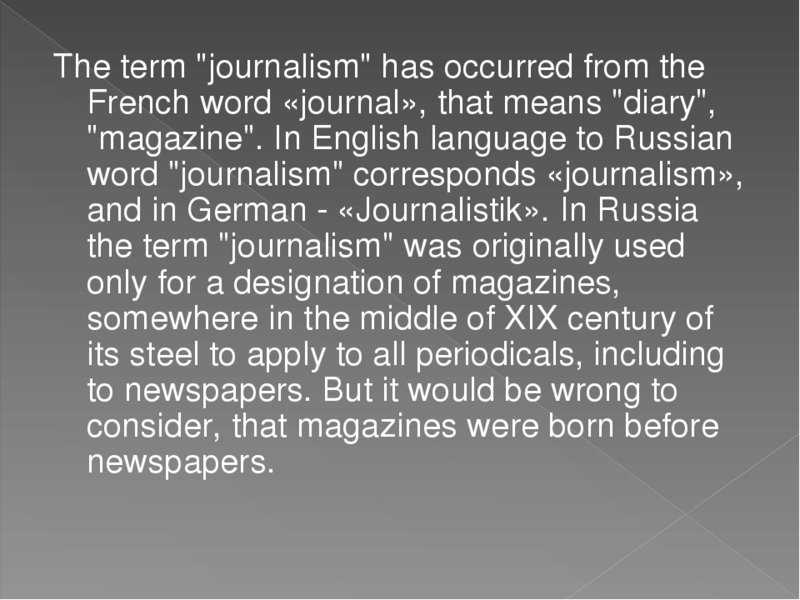 In Russia the term "journalism" was originally used only for a designation of magazines, somewhere in the middle of XIX century of its steel to apply to all periodicals, including to newspapers. But it would be wrong to consider, that magazines were born before newspapers. The first printing newspaper has appeared at Peter I. On Peter I plan in it it should be informed on «foreign and internal incidents». 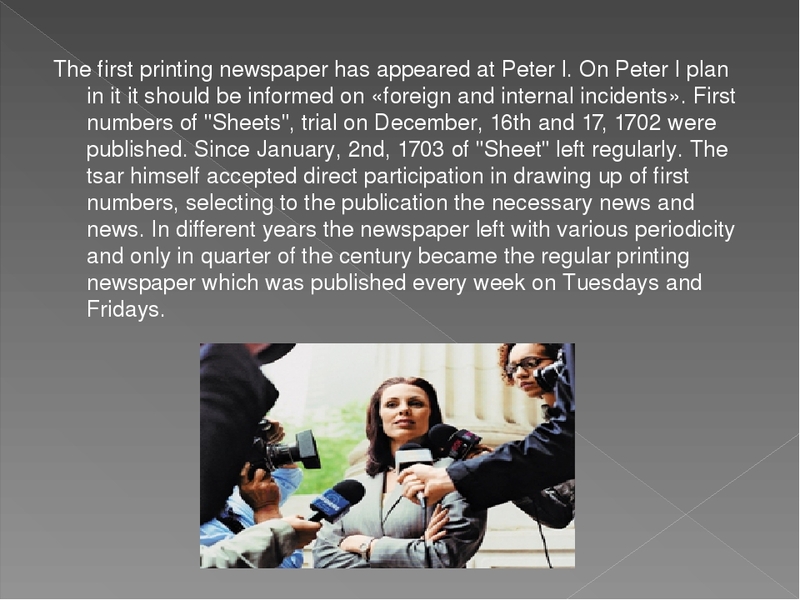 First numbers of "Sheets", trial on December, 16th and 17, 1702 were published. Since January, 2nd, 1703 of "Sheet" left regularly. The tsar himself accepted direct participation in drawing up of first numbers, selecting to the publication the necessary news and news. In different years the newspaper left with various periodicity and only in quarter of the century became the regular printing newspaper which was published every week on Tuesdays and Fridays. 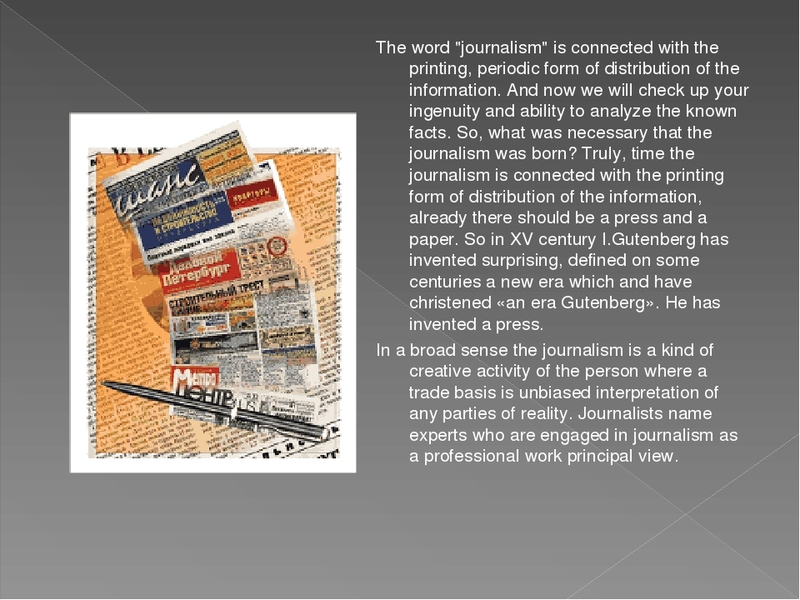 The word "journalism" is connected with the printing, periodic form of distribution of the information. And now we will check up your ingenuity and ability to analyze the known facts. So, what was necessary that the journalism was born? Truly, time the journalism is connected with the printing form of distribution of the information, already there should be a press and a paper. So in XV century I.Gutenberg has invented surprising, defined on some centuries a new era which and have christened «an era Gutenberg». He has invented a press. In a broad sense the journalism is a kind of creative activity of the person where a trade basis is unbiased interpretation of any parties of reality. Journalists name experts who are engaged in journalism as a professional work principal view. 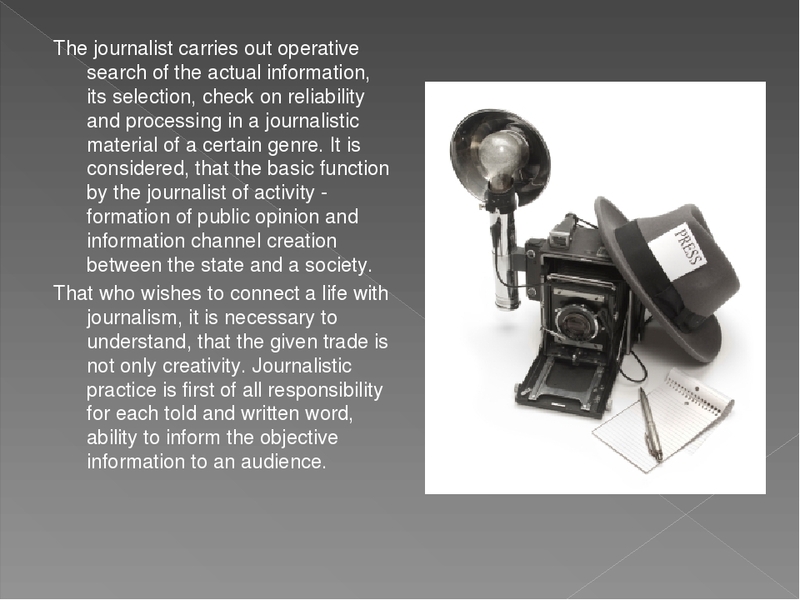 The journalist carries out operative search of the actual information, its selection, check on reliability and processing in a journalistic material of a certain genre. It is considered, that the basic function by the journalist of activity - formation of public opinion and information channel creation between the state and a society. That who wishes to connect a life with journalism, it is necessary to understand, that the given trade is not only creativity. Journalistic practice is first of all responsibility for each told and written word, ability to inform the objective information to an audience.